Downstairs toilet and separate shower room with sauna. Upstairs WC. Living room area off the kitchen, large sofa and easy chairs. Television, DVD player and CD player. Log fire. Kitchen with oven and hob. Fridge/freezer, microwave, and dishwasher. Washing machine situated in the shower room. Yllas is now Finland's largest ski resort and boasts the longest runs in the country. Despite this, the runs are often deserted by alpine standards, and the snow quality is superb. Many of the runs are floodlit, and a new gondola has just opened last year. 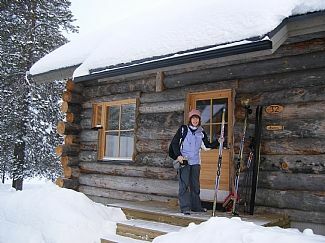 The ski resort is 2km from the cabin, and there is a free bus shuttle 10 minutes walk away. There are 320km of cross country ski tracks starting right outside the cabin, 38km of which are floodlit. There are 13 idyllic forest cafes dotted along the tracks. Apart from skiing, there are a host of other great fun winter activities. These include snowmobiling, Husky Dog rides and safaris, ice fishing and trips to the Snow Village and Ice Hotel. Add to this the opportunity to meet Santa in his own home (or arrange for him to visit your cabin) and all the ingredients are present for a magical, unforgettable winter holiday! There is a new golf course and resort in Levi, about 40 mins drive away. In the summer months it is possible to play golf round the clock, under the midnight sun! Notes on accommodation: Ideal for families. Outside: Private balcony/terrace area facing into the forest. Utility Room: Electric drying cupboard in porch area. Separate ski waxing room shared with other cabin owners. Cleaning / Towels / Linen / Maid service: There is a small extra charge for linen and towels, dependant on number of guests, and a charge is made for cleaning the property at the end of the rental period. Cabin - out of this world. Well maintained, spotless, plenty of room, superb facilities and excellent location. Customer service fantastic from arrival to departure. Have already recommended this to a number of people. Ski-ing, snow mobiling, sledging, and a visit to the Snow hotel, 12 miles away. Magic. Santas house and restaurant. Had santa visit the log cabin which was absolutely class, Im back to believing!! All restaurants are great and children are especially well catered for. The owner, Stephanie, was a pleasure to deal with and made everything easy. I couldnt recommend this place enough, we had a holiday that dreams are made of. Kittila airport is 30 minutes drive away from the cabin. During winter, charter flights operate to Kittila from Gatwick, Manchester, Bristol and Birmingham. Scheduled flights operate via Helsinki. There are a number of budget airline options, with Ryanair flying to Tampere in southern Finland, or Stockholm, from where connecting flights north can be caught. The resort has good rail access try taking ‘The Santa Claus Express’ sleeper from Helsinki. Akaslompolo has a great new Supermarket which is 1km from the cabin. There are a good range of restaurants, gift shops and a good Sports shop. Probably the best restaurant in the village is a short 50 metre walk from the cabin, through the trees. Yllas is a quiet resort with good facilities and amenities, ideal for a family holiday. Yllas is also a great place to visit in summer. Opportunities for salmon fishing are superb, with 30lb fish not uncommon in the nearby Muonio river. Trout, sea trout, greyling and whitefish are also present in the smaller rivers and lakes. There are excellent local fishing guides available. Akaslompolo is centred around a lake, which makes it ideal for boating, swimming and fishing in the summer months. There are hundreds of kilometres of walking tracks, and mountain biking is becoming increasingly popular in the area. There are also opportunities for pony treking in the summer months. Booking Notes: 20% deposit payable on booking, remainder payable 10 weeks prior to rental period. Changeover Day: Preferred rental period for 1 or 2 weeks, but shorter stays are possible. Preferred start days Saturday or Sunday. Notes on prices: Prices are for the property per week in UK Pounds, and includes heating, electricity, final cleaning and firewood. A charge of £20 is made per person for bed linen and towels. Short breaks by arrangement.